Many guys believe that their shoulders are weak muscles that easily can break if worked out too hard. They minimize their shoulder workouts and stick to simple exercises such as lateral raises or the popular Arnold shoulder presses. It is not true that your shoulders are weak and you shouldn’t train them. In fact, training shoulder will also benefit your back and chest workouts. So, when training your shoulders, make sure to pay serious attention and train them just as hard as the rest of your body. The foundation of a well-trained upper body lies in a good shoulder workout. So how do you get ready for the ultimate shoulder workout doing the best exercises, and precisely what are these? In this post, I am going to give you some of my all-time favorites when it comes to the best exercise for your shoulder workouts. It is essential that you keep your shoulder workouts as simple as possible but using the best possible exercises to add some size and strength to your deltoids. Using the ultimate shoulder workout, I prefer doing this routine every 5 to 7 days. Also, keep your shoulder workout as far away from your chest workouts as possible. SO if you, for example, are training chest on a Monday, then at least wait until Wednesday, preferable Thursday of Friday before training your shoulders. With this workout, we are going to pay some serious attention to your shoulders. Our goal with this ultimate shoulder workout is, of course, to add some size and mass to your shoulders. But this workout is also about creating a good solid foundation for your chest and back, so you will be able to not only improve your lifts but also be able to add some size. I like to use lateral raises as a warm-up, getting some blood running to my shoulders and prepare for some heavier lifting. With lateral raises, I recommend you to do four sets with a rep range starting 15 and down to around 8 in the last set. When doing this exercise, make sure to keep your feet on the ground. Some guys get this dancing movement where they end on the tops of their toes when they dumbbells are raised. Don’t do that. Also, make sure you are not bouncing your back. If you do, you must consider going lighter with the weights. Usually, I like to do two different press exercises when I am working my shoulders, dumbbell presses, and military presses. Again, because your shoulders are not weak and the presses are the best muscle builders of all shoulder exercises. I like to start with dumbbell because it activates the surrounding muscles a little bit better than the military presses. Here I do four sets with a rep range between 15 and often all the way down to 6 to be able to squeeze my shoulders to the max. Sit on a bench doing this exercise and keep the angle between 75 and 85 degrees. Make sure you are not bouncing your back when pushing the weights. Often you will see the military press exercise performed standing. But you can do it seated as well which will give you a couple of benefits. First, your shoulders will be working more concentrated because you will not be able to use the rest of your body and gravity to push up the barbell. Second, you will not over-arching your lower back as many guys are doing performing this exercise. Again stick to 4 sets and a rep range going from 15 and down to 8 in the last set. If you prefer to do the military press exercise standing, then I recommend you to check the video below to avoid common errors that may destroy your back. Since you already have used dumbbells for your lateral raises, you can with great benefit use the fly machine and do the simple exercise rear delt fly. Make sure to keep your body straight and do not bounce with your back performing this exercise. If you do, you might want to go lighter with the weights. Because they don’t see them in the mirror, a lot of guys tend to overlook their rear delts. However, there are a lot of benefits to getting from this exercise. It will tend to push your delts back and make your chest move forward and look bigger. Because your front delts are rather small and because they are getting off training doing chests, it should be more than enough to do some front raises as one of the finishing exercises in your ultimate shoulder workout. Notice what Scott Herman is doing in the video above? With his movement he is activating a more significant part of the shoulders, making his way of doing front raises more effective! Again, stick to 4 sets and a rep range between 15 and 8. Finally, to squeeze the last out of your shoulders and to get your neck more involved you should do some shrugs. Doing this exercise will add some size to your neck and make you stronger in both your back and your chest section. Do four sets and a rep range between 15 and 8. So far we have been covered exercises that will give you size and strength. But there are a lot more to your shoulder muscles than just getting that nice rounded sweep. As I mentioned, in the beginning, your deltoids, shoulders, are the foundation to be able to build a massive chest and back. A couple of exercises you also should incorporate in your ultimate shoulder workout are some rotator cuff exercises. Doing these couple of exercises as shown in the video will feel awkward in the beginning. It is because, as a starting point you will have very little strength in your rotator cuff muscles. But keep doing them and make them stronger. Having stronger rotator cuff muscles will add overall strength to both your chest, back, and shoulders. It means you will be able to lift more weight, benefitting your whole workout. Because your rotator cuff muscles have everything to do with the movement and the rotation of your arms, you will be able to improve your swing in sports such as baseball, tennis, golf and other team sports involving a ball. Years of heavy bench press lifting and military presses where the form not always has been a priority will wear out your muscles. Here recuperate and prevent injuries by doing the rotator cuff muscles at least once a week. Sometimes you may experience a certain click on your shoulders while doing your ultimate shoulder workout and are bench pressing. It usually is not painful, but it is a sign of weak rotator cuff muscles. Here it is highly recommended getting started training them. What about exercises like Arnold shoulder presses? You can either do them in the beginning as a warm up instead of lateral raises or as a finisher to wear the last power out of your muscles. It is an excellent exercise for either of these, but it is not a mass builder so don’t rely on totally on Arnold presses just because a legend is behind them. First, remember to check our similar article to this one How To Get Bigger Arms – The 1 Muscle Building Secret You Must Learn! In this article, you will learn how to create a powerful workout to get bigger arms. 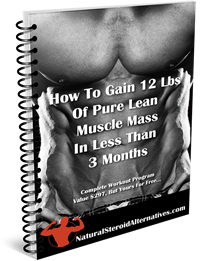 You will also learn one muscle building secret that will give you better results. Also, don’t forget to check out our Testo Max review a popular steroid alternative that can boost your testosterone levels and increase your size and strength. Also, check out our review of D Bal another powerful steroid alternative that mimics one of the most popular steroids ever, Dianabol. Finally, Trenorol, if you don’t want too much size, but more are looking for an overall improvement of your body. Martin is a personal trainer, fitness coach and blogger. He has been working as a personal trainer helping people to lose weight, getting in shape, and to build lean muscles. Currently, Martin is spreading the fitness word online using blogs and websites.